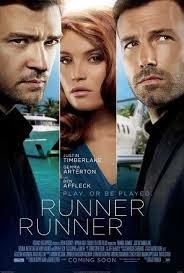 Runner Runner which features a star studded cast of Justin Timberlake, Gemma Arterton and Batman aka Ben Affleck is out next Friday. It is still possible to get/win tickets for next week's screening. Richie, a Princeton college student who pays for school with on-line gambling, bottoms out and travels to Costa Rica to confront the on-line mastermind, Ivan, whom he believes has swindled him. Ivan sees a kindred spirit in Richie and brings the younger man into his operation. When the stakes get incredibly high and dangerous, and Richie comes to fully understand the deviousness of his new boss, he tries to turn the tables on him.